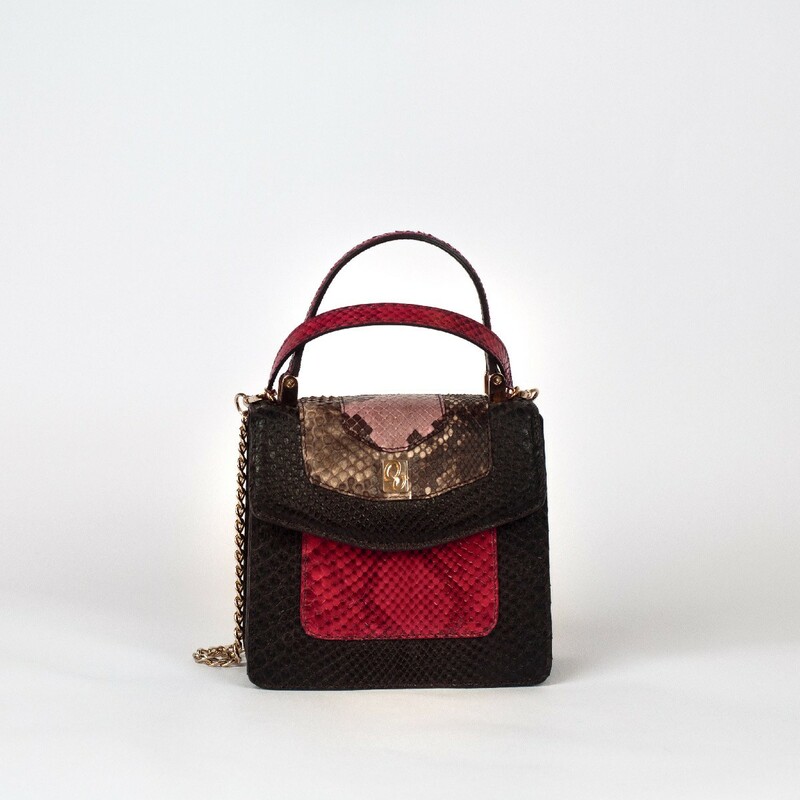 Since summer is the perfect season to leave the big bags that accompany us in winter, today we want to introduce the little Adele: a mini bag with a 40’s diva allure . In fact, it has a reduced size: with its 31x14x5 cm, it is placed in second place among our smaller bags. From the beginning of its production, it immediately became a bestseller: produced in every color and material, it was so appreciated that we decided to include it in our ICONIC collection. The particular shape of the bag is graceful and unexpected: elongated and not so tall, with a soft line but with a stiff handle to carry it like a real diva. If you prefer comfort, you can wear it on the shoulder thanks to its golden chain shoulder strap and you’ll immediately have a modern and casual chic look! 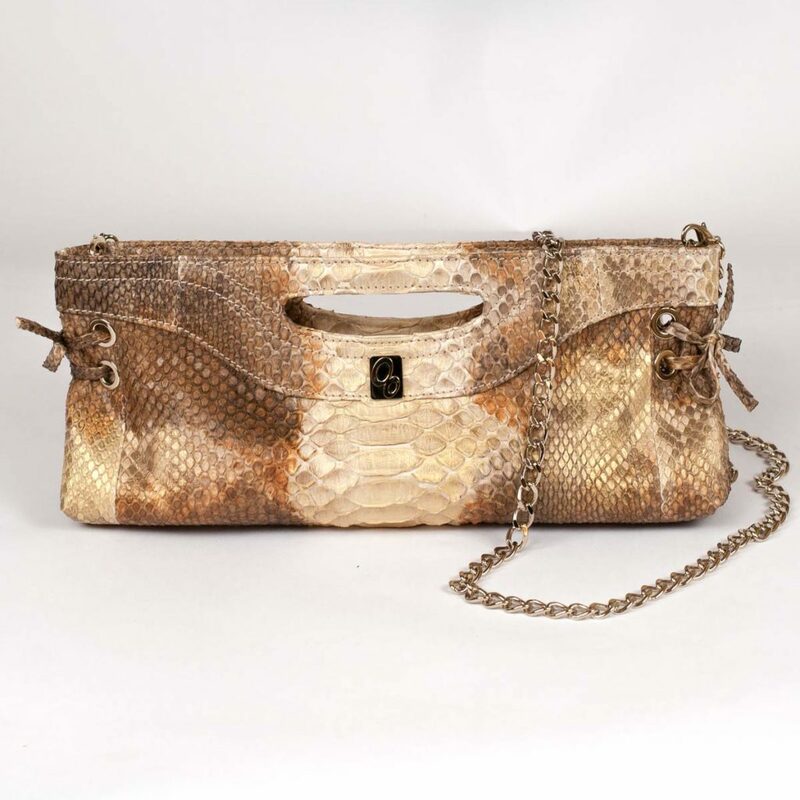 We have 4 versions of Adele that are ready for delivery: Adele in red ostrich, Adele in Sky blue python, Adele in Grapefruit Gelato python and finally Adele in Gold Sand python. When you want to give a touch of elegant and refined color to your look, this bag is the solution. 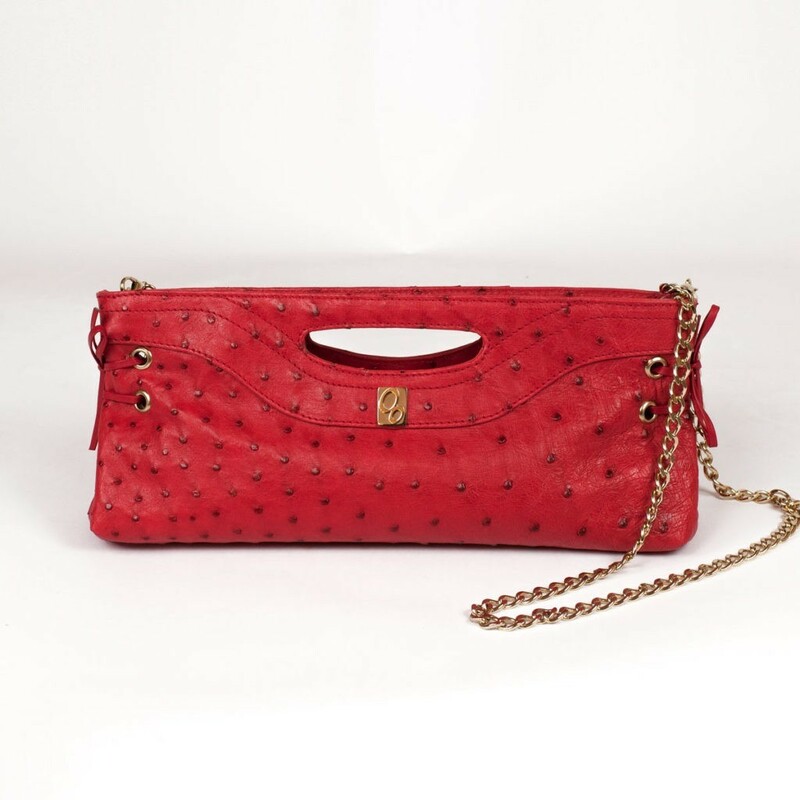 Made of genuine ostrich leather, rich of follicles, this variant has a red passe-partout tonality: the shade has a touch of blue that softens the warm undertones of the bag, making it perfect for every season. To wear on the shoulder with its golden chain strap for a modern look or in your hand for a retro and refined look. 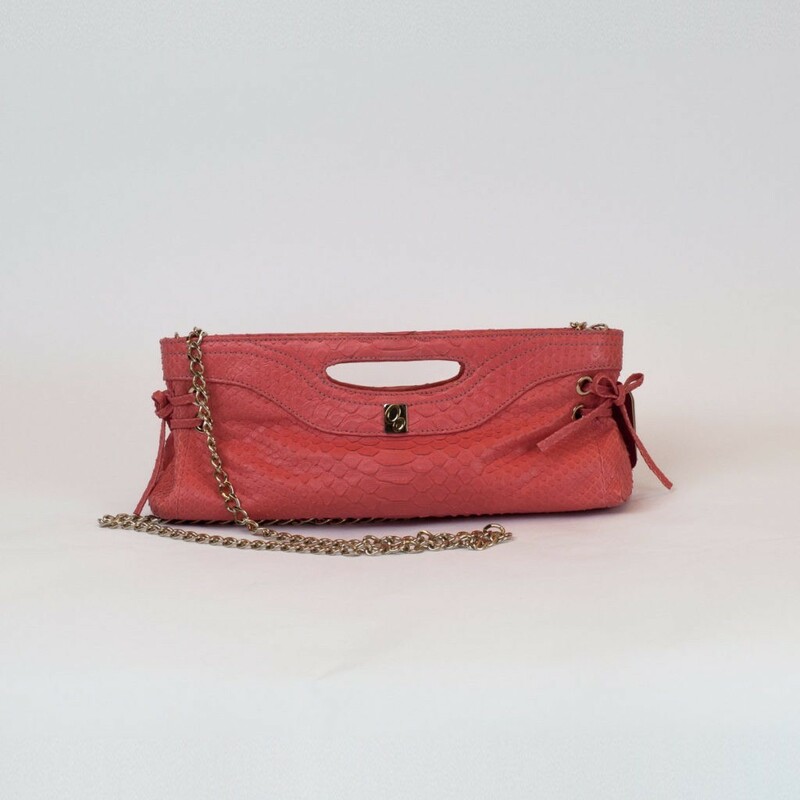 The sky-blue variant is totally different: the genuine Reticulatus python leather has not been deprived of its natural livery and the choice to use a front-cut (the back of the animal) has created a particular play of light and dark contrasts that gives the bag a fresh and summery look. Thanks to the little, closed together and homogeneous scales, the look is not lost on the texture of the python, but it focused on the unusual color. It is the perfect daytime bag for when you want to stay light and carefree. In this variant we wanted to focus all the attention on the texture of the leather. In addition to being deprived of its natural livery, the back cut (the belly of the animal) was chosen with its scales of different size and shape; the colour gracefully vibrant enhance even more the texture of the leather. Perfect to accompany you to a cocktail in a summer evening. Pair it with other summery colors for a fresh look or to a little black dress for a touch of refinement. This is the most original variant of the Adele. The undisputed protagonist is the color: a mix of gold, beige and bronze with a metallic and pearly finish. The back cut of the python Reticulatus makes it even more unique thanks to the scales of different dimension. A bag for those who don’t want to go unnoticed. If you don’t love bags with mainstream lines but prefer those with more personality, this model is for you. Take advantage of the summer sale to have it at a special price! This entry was posted in Presentation products, Shopping Online on 08/10/2018 by Serena.